This Atlas was created as a part of Master Thesis research program at The City University of New York and The New York Botanicl Garden during 2002-2003 and should not be considered as an extensive list of all bat-pollinated plants found in French Guiana. The Pollen Atlas consists of more than 100 SEM pictures illustrating about 60 species of plants either known or suspected to be pollinated by bats. For each species, views of the entire pollen grain as well as a close up of the exine ornamentation are provided. For some species, additional images are included, especially when they may give helpful hints for identification of the pollen. The images are arranged by scientific name and by ornamentation type. Because it is sometimes difficult to classify the ornamentation as one type or the other, the same species is sometimes included under several different ornamentation types. Although this research was focused on bat-pollination systems in undisturbed rain forest, some commonly visited cultivated species, such as Crescentia cujete, were included. The goal of the Pollen Atlas is to facilitate the identification of pollen carried on the fur or excreted in the feces of bats. It can be of use to those wishing to carry out ecological studies of bats in the Guianas. Once the species were determined, the pollen was extracted from specimens archived in the herbaria of the Institut de Recherche pour le Développement in Cayenne (CAY) and The New York Botanical Garden (NY). 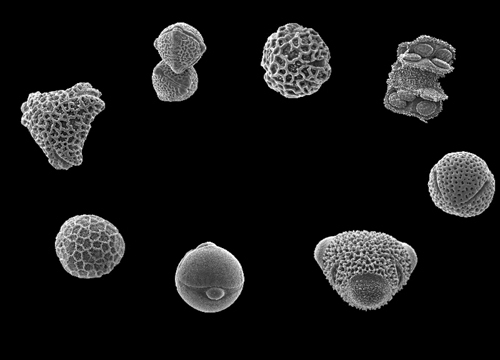 Pollen samples were mounted on aluminium stubs and examined and photographed with a Scanning Electron Microscope (SEM) at The New York Botanical Garden. There is, however, a problem that complicates the identification of sputter-coated pollen. Even though the time of coating for pollen was standardized at two minutes, there is still considerable variation in the thickness of the coating, sometimes even on the same stub. This is especially true for pollen with relatively shallow ornamentation and in fact, the same species with a thin sputter coating may appear ornamented whereas a thick coating can result in a nearly smooth appearance. In this section, the pollen images are displayed according to ornamentation type. For each ornamentation type, the pollen is presented in a single table by increasing pollen size. Because of the difficulty in interpreting the ornamentation type, some species have been placed under several types. For example, Mabea piriri is included under "reticulate ornamentation" and under "perforate ornamentation." Eight ornamentation types were distinguished, 7 of which were used in Gretchen D. Jones; Vaughn M. Bryant. The “perforate type” was added that classified under “reticulate” in Gretchen D. Jones.